Pfeffernüsse are a traditional German treat. The name literally translates to "pepper nuts," but they're really a kind of gingerbread-ish cookie. They've got some unique spices and they're sweet, soft, and covered in a layer of powdered sugar. Once again, we find a perfect instance for the Trader Joe's company to use one of their ethnic names - we encountered Baker Josef last year, and he was pretty good at what he did. Though "Josef" might be from any number of European nations, Deutschland is certainly among those he might be hailing from. When I studied German in school, the name I chose for myself was "Jörg." Although "Josef" is a better translation of "Joe," I think "Trader Jörg's Pfeffernüsse" has a nice ring to it. 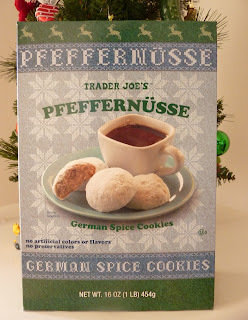 On the box, there's mention of a German tradition in which pfeffernüsse are dipped in wine when served to guests during winter holiday parties. After trying the cookies, both Sonia and I thought that sounded revolting, so we had them with milk instead. However, in the days following, out of curiosity I looked up which wines might pair with something like these cookies. The sites I found mentioned some dessert wines, such as a Riesling, which made some sense, as well as Pinot Noir, which fascinated me thoroughly. How could gingerbread go with a flinty red wine? I found an excuse to pick up a bottle shortly thereafter and immediately dipped one of the "pepper nuts" into my Napa Valley Pinot Noir Wine Glass as one might dunk an Oreo into cold milk. I was amazed. It was delicious - and very unique. It was at once dessert-ish, earthy, and spicy. I highly recommend the combo. Some of you lucky enough to live near a TJ's that sells wines might be able to pick up some Two (or Three) Buck Chuck Pinot Noir. I tried it back in my California days, and was pleasantly surprised, not that I'm any kind of connoisseur. In case you were wondering, we've only done one wine review on this blog, thanks to PA's archaic alcohol laws. By themselves, these cookies are tasty enough. If you like particularly spicy gingerbread, you'll probably enjoy these little German treats. Of course, in this case, when I say "spicy," I don't mean hot in any way. I mean they're full of cinnamon, cloves, allspice, and nutmeg. And technically, I guess they're not really gingerbread—they just remind me of it. My wife gives these pfeffernüsse 4 out of 5 stars. I'd give 'em a 4, too—if they came with a mini bottle of Pinot Noir. 3.5 stars as they are. Just a random note -- my grandma is of German/Russian Mennonite Brethren background and we always had pfefferneusse at Christmas. I made some last year based on her recipe. But they never quite looked like those. Ours contain ground fruit and nuts, cinnamon, cloves, black pepper etc and are rolled, cut small (2 bites), no powdered sugar, more chewy/crunchy than soft. Interesting to me to see TJ's variation. These are my favorite Christmas cookies from TJ's! I'm not saying they're the best cookies I've ever had, but they're a festive tradition. And guess what? My local Trader Joe's doesn't have them this year! WAAAH. try dunking those in Robert Hall Cab!. You will love it...it will make the cookie taste even better! Your grandma's version sounds pretty good, renita! Thanks for the suggestion, KBF...a Cabernet and pfeffernusse sound good right about now! Too late now, but next year I recommend you eat them with gluhwein (German mulled wine). I am seriously addicted to these! My favorite cookie , hands down. Yeah, they're pretty good, aren't they? Really unique. I'm afraid that though I really enjoy the spiciness of the interior of this cookie, the sugar shell and layer of powdered sugar is always a detraction for me. Maybe...next year I will try them again, with the mulled wine?